In 1853, Major Bulloch's daughter, Mittie, married Theodore Roosevelt Sr. in the dining room of this historic house. Their son Theodore Roosevelt became the country's 26th president. 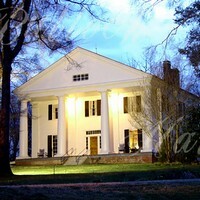 Visit the house to hear the fascinating story of the family who lived in this beautiful antebellum home. Completed in 1839 for Major James Stephens Bulloch, one of Roswell's founders, Bulloch Hall is a Greek Revival structure and one of the South's finest examples of true temple-form architecture. Bulloch Hall's permanent exhibits include a Museum Room chronicling the life of Mitte Bulloch, a Children's Room with hands-on activities, and a reconstructed Slave Quarters that houses an exhibit recognizing the role of African-American slaves in the history of Roswell. Tours of the house are offered each hour Monday through Saturday with the first tour starting at 10 a.m. and the last tour starting at 3 p.m. and Sunday with the first tour starting at 1 p.m. and the last tour starting at 3 p.m.